We Specialize in No Insurance Dentists with payment plans – Search our Emergency Dental Directory. Have you ever found yourself suddenly hit with a dental emergency? Severe tooth pain, sudden sensitivity, lost braces? Or maybe you find yourself of need in emergency dentures. These and other problems can leave you feeling helpless when they happen outside of normal business hours. That’s why, at Emergency Dentists USA, we work with expert dentists like Dr. Greg Grillo to help you find the best dental care for adults with no insurance. Not sure if you can afford the payments that come from an dentist office near you? That’s why we’ve written the article below. You’ll find that all of our information is carefully sourced and evidence-based, so you can walk into your first appointment with a no insurance emergency dentist with confidence. As always, no single article can serve as a replacement for a one-on-one session with your local dental professional. We hope that we can provide a thoroughly-researched starting point that will help you understand what to expect from a visit to an emergency dentist, but we strongly recommend that you consult a professional working dentist about any dental health issues you are currently experiencing. What Types of Dental Payment Plans are Available? It’s an unfortunate fact of life that many patients consider going to the dentist to be a financial burden. Standard checkups and cleanings can really add up on their own, but emergency dentist visits are the biggest inconvenience of all because it adds a major cost to your day that you weren’t expecting to pay. According to the CDC, about 65.7% of American adults (aged 18 and older) required a visit to the dentist in 2016. About a third of those patients lacked insurance, getting dental care for adults with no insurance can be quite complicated. Studies have shown that those who lack dental insurance are less likely to visit the dentist when they need serious care, but there’s no reason to be afraid. Most dentists know how to work with patients who don’t have insurance and will offer no-to-low-interest affordable dental care to these customers. Get help finding the right dentist, we have a directory that will guide you, particularly when seeking a Saturday Dentist. Finding a list of dentist near me that take payments will jump to the top of your priority list when you incur a sudden emergency: a 2009 study based on the National Emergency Department Sample reported that emergency dental caries were the leading reason for 41.8% of all Emergency room visits, and when patients see the bill, they are almost always incredibly surprised. Seeing a dentist without insurance has become more common than ever, as many policies simply do not cover emergencies, and deductibles have risen significantly. Even if you’re looking for a more natural dentist who focuses on holistic treatments, there may be naturopathic dentist available who can help you even if you don’t have insurance. In many cities where low-income individuals desperately need help, the line for this kind of care can literally wrap around the block. 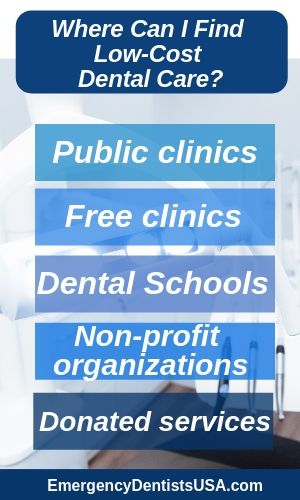 Public dental clinics are taxpayer-funded and run by local or state health departments. They are a great source to receive dental care as they offer low, fixed prices on basic dental care procedures such as cleanings, x-rays, root canals, and fillings. Some public clinics may even work on payments with you based on what you can afford. The United States has many dental schools across the country. There are at least two dental schools in each state making them rather accessible. The students in dental school need hands-on experience to graduate and often offer lower prices for dental care. Patients can receive care for half-priced or even lower. A licensed supervisor will be present at your entire appointment and procedures will be done exactly by the book. There are many clinics that are run by non-profit organizations. They serve those with low-income, no insurance, or anyone who can’t afford dental care. These clinics are staffed by volunteer dentists who provide full-service dental care. You can expect to pay no fees or pay based off what you can afford. State and national charities often use donate labor and materials to provide free dental care. Various programs offer care to those who are elderly or have disabilities and permanent medical conditions. Other programs match low-income children with volunteer orthodontists to receive braces or other dental care. Dental plans are available to you and help you save money on your dental care. They offer discounts and other benefits for when you head to a dental visit. Emergency dentists USA has teamed up with DentalPlans.com to save you 15%-50% off your dental care. Find the right dental plan for you here: https://www.emergencydentistsusa.com/dental-plans/. Careington is also a good resource for finding a dental plan. Their plans start for as little as $8.95 per month. They are committed to providing quality healthcare. They offer plans for businesses, brokers, and dental offices to supply healthcare to anyone who may need it. Two decades ago, you could just walk in to an emergency dentist’s office, tell them about the pain you were experiencing, get some x-rays to diagnose the problem, and perhaps some antibiotics to fight infection. You wouldn’t have to pay until the end of your appointment, when the dentist would guide you through the process of starting a low-interest payment plan. These types of plans are still available, but the nature of walk-in appointments has changed. When you walk into a dentist’s office, as soon as you enter, they may sense that you have a sense of urgency for your dentist near me no insurance visit. Many of them will ask for your debit card number before you are even seen. What Changed with Dental Payment Plans? As our expert emergency dentist Dr. Greg Grillo (DDS) explains, after the Great Recession of 2007-2009, many people began losing their jobs and defaulting on payment plans for homes, luxuries, and (of course) dental and medical bills. When the carnage trickled down to the dental industry, many specialists found themselves with thousands of dollars of unpaid bills, which then need to be turned over to collection agencies. As the economy got worse, dentists had to protect their livelihoods just like everyone else. This is why they now expect you to commit to a payment plan upfront, instead of receiving your care first. If you have just moved to a new city where you do not have a large network of friends, the task of finding a good dentist near you may seem difficult. But we at Emergency Dentists USA have over half a decade of experience connecting thousands of patients with qualified emergency dental care. If you’ve been in a traumatic accident or need emergency care it’s important to know whether you should go to an emergency room or an emergency dentist. Emergency room doctors are going to be best equipped to treat any head trauma that you’ve endured. They can provide CAT scans and other treatment required to deal with head trauma better than an emergency dentist. However, if you’ve sustained multiple oral injuries, you will want to visit an emergency dentist. While an emergency room doctor may be able to temporarily relieve any pain, an emergency dentist will be fully equipped to treat any oral injury you may have. If you don’t have any insurance, going to the Emergency Room will be an expensive trip. For dental care, there are many dental insurance plans to help cut the costs of dental care prices. However, if you are struggling with income there are other resources you can use to receive the healthcare you need. Many patients may have fears that an payment plan dentist will not be able to see them quickly, or will not provide them with the best possible care. It’s true that emergency dentists have their own overhead that they need to be concerned with: hiring staff, keeping up with equipment needs, and their insurance policies. However, there are numerous low cost dental options available to you. Our Emergency Dentists USA web portal includes a listing of many dentists who accept patients that don’t have insurance. These dentists have been thoroughly vetted by experts in their field, so you can trust our experience and the partnered practives we feature on our site. There are also dental savings plans that operate a bit like a warehouse club membership. If you wish to, you can pay a yearly fee that entitles you to price reductions on dental work. Discounts vary from 10% to 60% depending on the dentist offering the plan, the amount of money you are able to pay, and the types of procedures that you need performed. When you have a loved one who encounters a suddenly cracked tooth or otherwise painful dental emergency, the last thing you want is to have to scurry around and quickly locate a dentist with payment plans near you. You can quickly connect with a web search or phone call by using our portal, whether you are anywhere from Sacramento to Seattle. There are thousands of open dentists nationwide linked to our network! Why trust us? 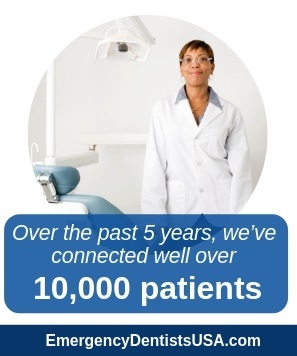 Over the past five years, we’ve connected well over 10,000 patients just like you to expert emergency dentists in their area. We partner with experts to make sure we’re sending you to the best possible dentists in your area and we always make sure that you’re kept informed of the latest procedures and benefits when you visit an emergency dentist. No one else can boast expertise like ours! If you’re searching specifically for a female dentist, our services can help you too. We’ve been connecting patients to cost efficient dentists for half a decade now. We’ve built a large network of connections and our site contains numerous listings of no insurance dental clinics nationwide. With one quick call you can locate a professional to give you X-rays, make sure you have a plan for treatment, and put an end to your pain right away. There is nothing quite as harrowing as being in a foreign city, breaking a tooth, and not knowing exactly where to go for dental care without insurance. Business travelers are one of the most common types of patients we deal with. We also get a lot of calls from chaperones of student trips: what happens if the time is late at night in a foreign city, and all of a sudden a member of your group is in need of urgent dental care? That’s why we’ve built a network of experienced connections across the United States – no matter where you are, we know someone nearby who can help you start living a pain-free dental life. Many times as a business traveler, you may be looking for a true weekend dentist, or one that can help you as a dentist near me that take payments. Our toll-free helpline is open 24 hours a day, 7 days a week, and 365 days a year, and we work with dentists who keep all kinds of hours. Give us a call, and we’ll even set up the appointment for you! If you just embark on a standard search engine inquiry, you may be steered again and again in the direction of those who will not answer the phone, and simply relay you to voice answering services. When we set out to create this portal over half a decade ago, we realized how important it was to help people locate a professional with ease, one that would treat them with respect even if they were not covered by insurance. Sometimes it is hard to get in touch with parents, guardians, and anyone else who may be able to quickly help someone on a field trip or end-of-year celebration quickly. Many teens and college students who are making trips on their own for the first time find themselves in need of dentistry without insurance, which is why our expertise in this area is so valuable. We know that seeing a dentist can seem frightening when you don’t have dental insurance or have no money for the dentist. That’s why when our company was first founded, we knew that we had a duty to make life easier for those who could not afford dental insurance as well as those who could. Having dental insurance has always been not as much of a guarantee that the procedure you need will be actually paid for, but more of a guarantee that you may have a huge deductible cost to wrestle with. We searched high and low for low cost dentists to add into our network – aided, as always, by our expert dentists – who always put their patients before their profits, and will do everything they can to provide reasonably-priced care in your hour of need. Make sure that our Emergency Dentists USA portal stays bookmarked in your favorites: you can use our resources to quickly locate dental care without insurance. You may already be spending so much on regular coverage that there is not enough to go around, and we understand that dental plans aren’t always what they are cracked up to be. Don’t spend the rest of the evening or weekend watching a loved one in pain, and let us do the heavy lifting during your search for you! Can I Go To The Dentist Without Insurance? Yes! The majority of American dentists offer payment plans and know how to work with patients who lack insurance (see the Forbes article cited above if you don’t believe us). Many people visit the dentist without insurance when they need relief for sudden oral and tooth pain. Not all dentist though will accept non-insured payments, so utilizing a service to help locate the ones who can can save you time in an emergency. Will The Dentist I Visit Take Payment Plans? It depends on the dentist – some will, some won’t. It might be contingent on whether you have a history with the practice, or if you’re able to make a sizable down-payment. As it can be difficult to find dentists that take payment plans, using Emergency Dentists USA can help you find one near you that does. Is It Expensive To See a Dentist Without Insurance? In the United States, an emergency visit to the dentist costs – on average – about $200-$600. This varies quite a bit based on the procedure you need to undergo and the location you’re in. You can see more statistics about dental payment plans by visiting the American Dental Association. Immediate Emergency Dental Care, No Insurance Required! - Click to Call!